New York's Common Fund, the Third Largest in the Nation, Manages Over $200 Billion in Retirement Assets for More than One Million New Yorkers. This proposed approach helps to address the complexity of the Common Fund's portfolio while providing a clear roadmap for de-carbonization. Adopting this approach will send a strong message to the financial markets that major investors, including New York State, are fully and aggressively committed to a carbon-free, clean energy future. Finally, the Governor calls on the Fund to dedicate a meaningful portion of the Fund's portfolio to investments that directly promote clean energy—which makes economic and environmental sense. "New York has made incredible strides in securing a clean energy future for this state with our nation-leading clean energy standard, off shore wind development, and aggressive investment in the clean tech economy, yet the Common Fund remains heavily invested in the energy economy of the past. Moving the Common Fund away from fossil fuel investments will protect the retirement savings of New Yorkers," Governor Cuomo said. "This proposal lays out a roadmap for New York's $200 billion Common Fund to take responsible steps to divest from its fossil fuel holdings, leading to a more secure retirement fund for countless New Yorkers while also helping to achieve the state's clean energy goals." The New York Common Fund manages approximately $200 billion in retirement assets for more than one million New Yorkers across the state. While the Fund is intended to provide long-term financial security for its members, it remains heavily invested in fossil fuels. In 2017, the Common Fund listed holdings in more than 50 oil and gas companies that have been identified as among the 100 most carbon-intensive in the world, a figure that has increased since 2016. With billions of public employee dollars invested in the fossil fuel industry, and nearly $1 billion invested in ExxonMobil alone, the Common Fund holds increasingly risky financial investments for New Yorkers, particularly as both New York State and the world back away from the use of fossil fuel as a primary energy source. For example, just last week the World Bank announced that it will end financial support for oil and gas exploration within the next two years, an announcement that itself comes on the heels of recent action by the Norwegian sovereign wealth fund, the largest fund in the world, to move away from fossil fuel investments. The Common Fund and Comptroller DiNapoli have been outspoken about the importance of incorporating environmental, social, and governance (ESG) considerations into the Fund's investment strategy. New York State has already taken major steps to reduce its carbon footprint and cut back on the use of fossil fuels as an energy source. Governor Cuomo's climate strategy is leading to a cleaner, more resilient and affordable energy system for all New Yorkers by stimulating investment in clean technologies like solar, wind, and energy storage and further requiring that 50 percent of the state's electricity needs come from renewable energy sources by 2030. Already, this strategy has driven nearly 800 percent growth in the statewide solar market, improved energy affordability for 1.65 million low-income customers, and created thousands of jobs in manufacturing, engineering, and other clean tech sectors. These efforts are continuing. Earlier in 2017, Governor Cuomo was a co-founder of the United States Climate Alliance, a group of states committed to meeting the emissions goals set forth in the Paris accords and to identifying ways to collaborate to address the challenges presented by climate change. 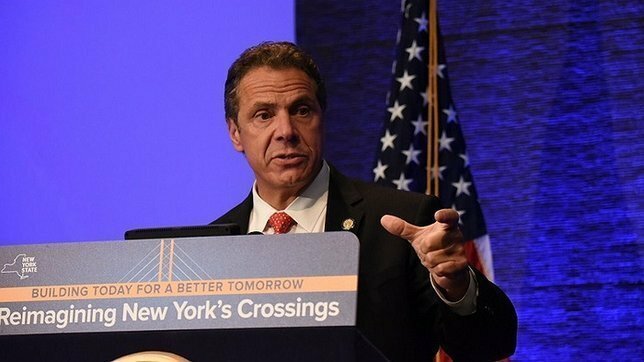 At home, New York is currently looking into additional, bold ways to advance Governor Cuomo's climate strategy, whether in the context of the State's procurement practices, the energy use in State buildings, or in connection with the promotion of electric and other zero emission vehicles. Today's announcement is yet another step in New York's commitment to tackle climate change, and its push to reduce statewide greenhouse gas emissions 40 percent by 2030 and achieve the internationally-recognized target of reducing emissions 80 percent by 2050. The Common Fund must take decisive and meaningful action to further de-carbonize, and this plan puts in place a concrete roadmap that provides for de-carbonization of the portfolio while maintaining the fiscal stability of the Fund. Subject: LongIsland.com - Your Name sent you Article details of "Governor Cuomo Unveils 9th Proposal Of 2018 State Of The State: Develop A De-Carbonization Plan For Divesting From Fossil Fuels"